ADC cast sheet is transparent and colorless. With a refractive index of 1.50, it transmits light as well as crown glass and better than other optical plastics. key applications include CRT, LCD and LED displays. ADC cast sheet has an average light transmission value of 92% which is almost the same as crown glass and higher than other plastic materials. Key applications include Electroluminescent and Liquid Crystal displays. The abrasion and scratch resistance of ADC cast sheet is approximately 20 times greater than uncoated acrylic and 50 times greater than uncoated polycarbonate. Key applications include industrial workstations and medical instruments. The excellent optical and mechanical properties of ADC sheet are not changed despite long term exposure to virtually any organic chemical including ketones, alcohols, aliphatic and aromatic hydrocarbons, and to cleaning solvents and alkalis. Key applications include safety shields, and medical, industrial and portable test instruments. The chart below highlights the superior resistance of ADC/CR-39® to long term exposure to a wide range of industrial chemicals. ADC sheet, at normal temperatures, has an impact resistance which is second only to polycarbonate, and much greater than tempered glass. Key applications include safety shields and portable instruments. ADC sheet is resistant to pitting from small hot flying particles, such as welding, cutting or grinding sparks. ADC sheet is also resistant to distortion due to high heat and can be used in applications where acrylics would distort or melt. Key applications include industrial work stations, process control instruments and safety shields. UL Rated: UL94HB. Fosta-Tek's ADC is manufactured with a higher concentration of ADC monomer (over 80%) resulting in superior flame resistance as evidenced by its UL Rating for horizontal burn (HB). ADC sheet will not craze, flake, haze, yellow, deteriorate, or loose optical properties when subjected to long term aging. UV-stabilized grades are formulated for long term exposure to hostile outdoor environments. key applications include outdoor process control instruments, portable test instruments, and navigation equipment. ADC sheet is more resistant to yellowing from long term light exposure than other optical plastics. key applications include outdoor industrial workstations and safety shields. With a specific gravity of 1.3 compared to 2.5 for glass, ADC cast sheet weighs only about half as much as glass. Key applications include avionics displays and portable test equipment. The charts below provide additional specifications. The chart below illustrates the superior abrasion resistance of CR-39 sheet compared to other optical plastics. The chart below presents a relative comparison of the key material options. 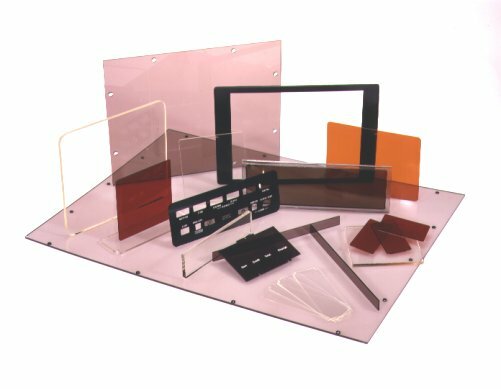 As it illustrates, ADC filters compare favorably to the other optical plastics and glass of 17 of the 21 design features cited, excelling in optical and chemical properties.